A big Thank You to Youghal Golf Club! 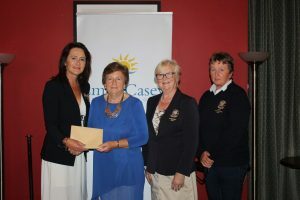 The Foundation is indebted to Youghal Golf Club and to its Lady Vice-Captain Paula Brennan for hosting the Emer Casey Foundation Open Golf Competition on 6th September. Juliette and Brendan Casey were delighted to attend the prize giving where Juliette updated the members on the work of the Foundation. A cheque for €900 was presented to the Foundation by the Lady Captain, Sharon Ormonde. Additional donations followed, bringing the total donation to €1000. Míle buíochas! Pictured are, from left to right, Lady Captain, Sharon Ormonde; Juliette Casey; President, Eileen Farrell and Lady Vice-Captain and sponsor, Paula Brennan.